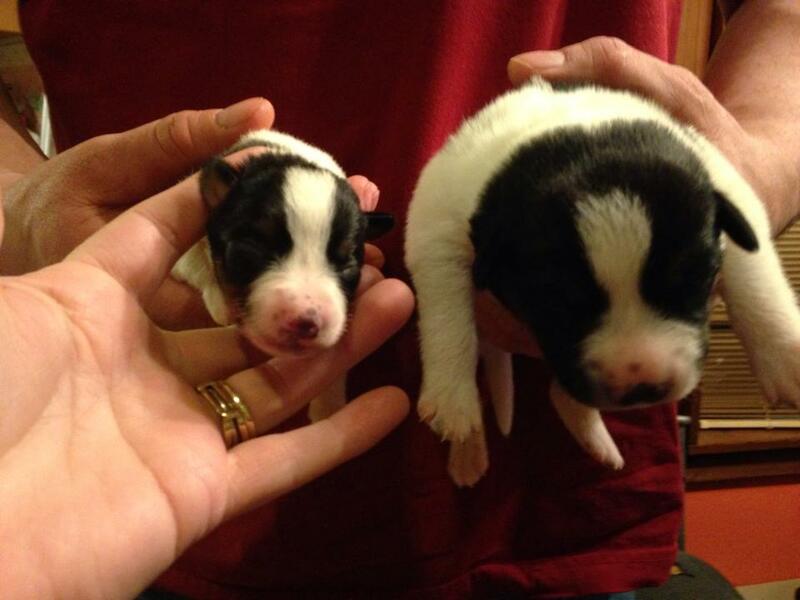 Our little family will be growing by four more feet in a few weeks when we adopt a new baby blue heeler! 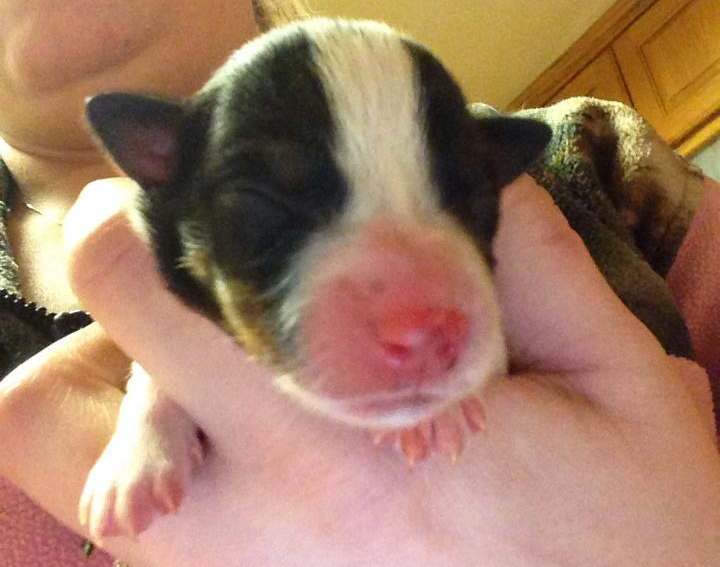 A woman we met through a local buy/sell page had a litter of blue heeler puppies and was expecting another, by accident. 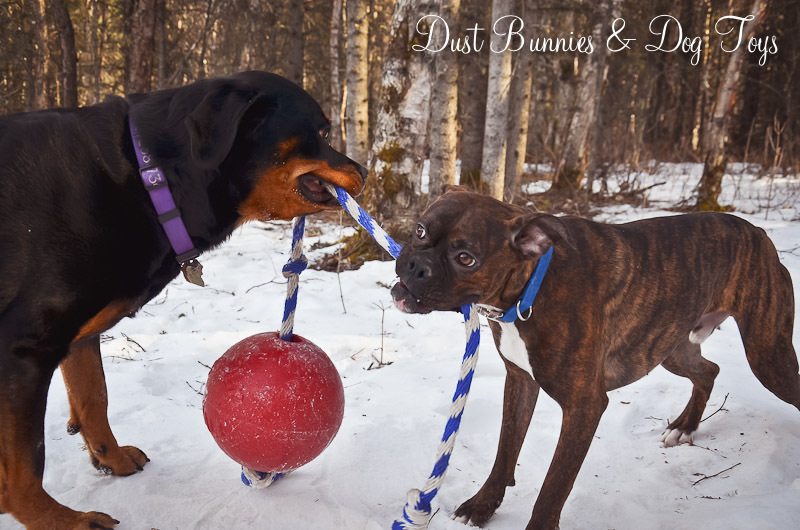 We contacted her about the dogs and got good feedback so we made arrangements to meet the expecting momma dog and see what her personality was like. Although she wasn’t very social with our dogs – who could blame her a week from her due date – she was well behaved and definitely people friendly, especially when those people gave ear rubs. 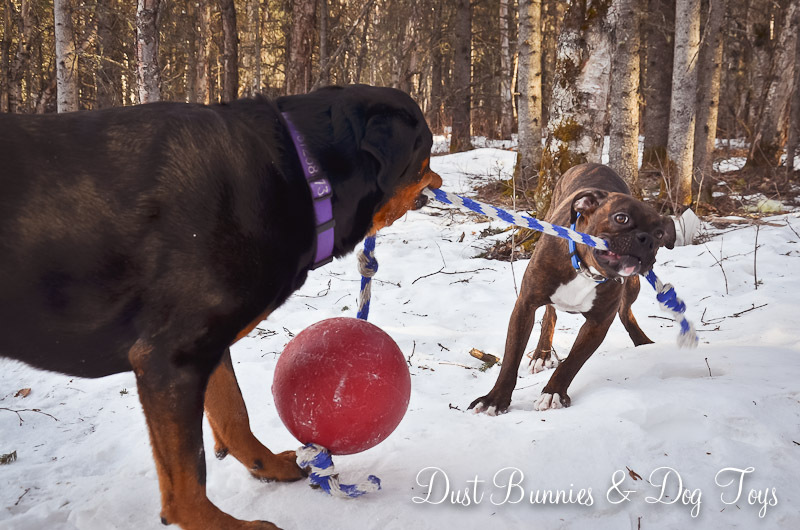 The woman who owned momma dog was excited to hear that we had a Rottie as well, which is the other breed in their home. She also liked the fact that we are previous heeler owners so we know what to expect and have plenty of space for such an active breed. She liked us so much that she told us we had first pick once the litter was born! A little over a week later she emailed me to say there had been 3 boys and 3 girls born the day prior. We knew we wanted a girl, so she sent pictures of those three. One was all white with just a snip of black on the tip of her ear. Another had a black mask on her head, but no other spots. 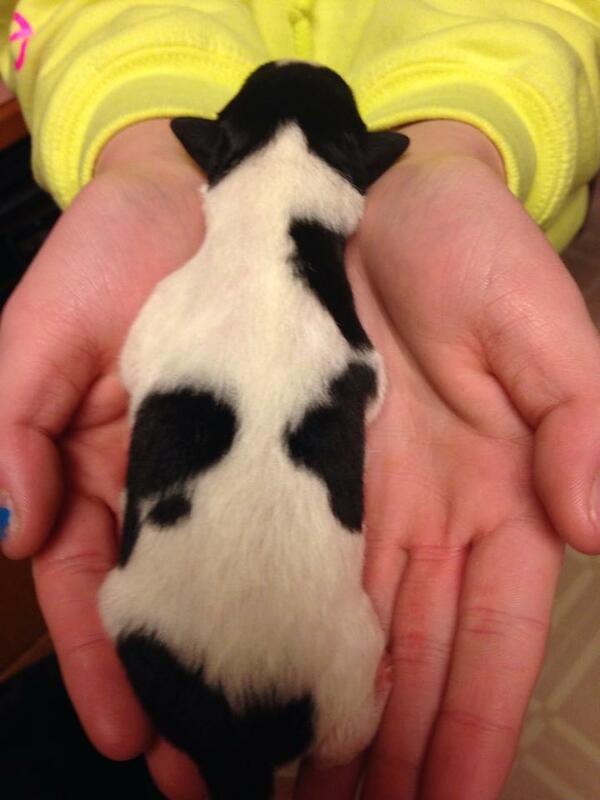 And the runt had a black mask with several body spots. 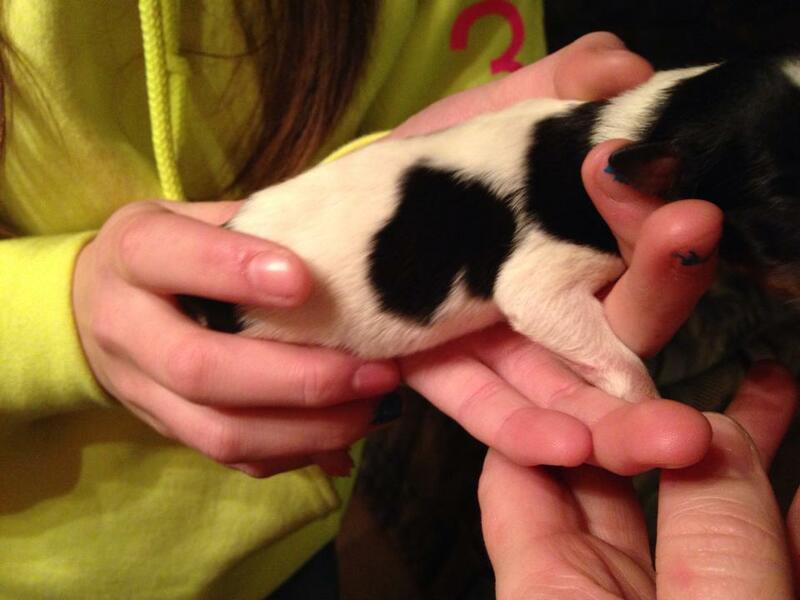 Including one shaped like an upside down heart on her side. 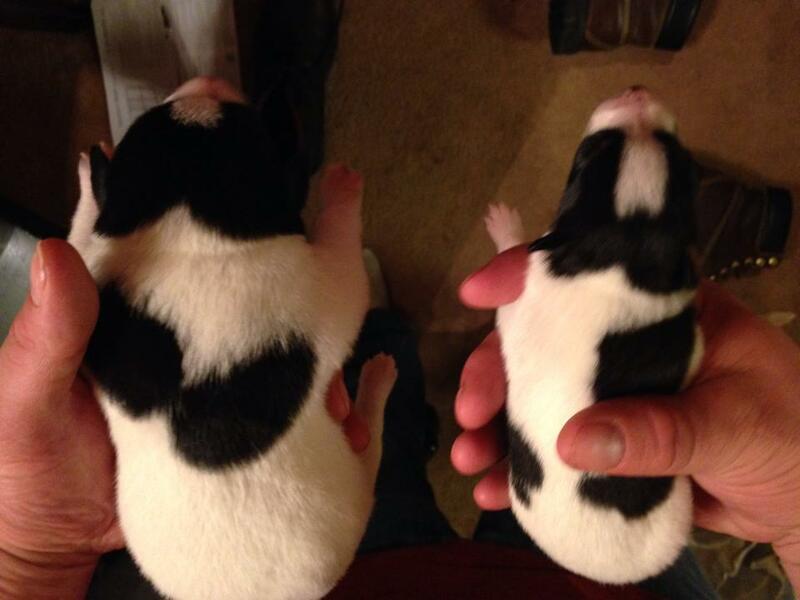 We discussed it and unanimously agreed we wanted the runt. As you can guess by the title of this post, we decided to continue our alcoholic theme and name her Bacardi. 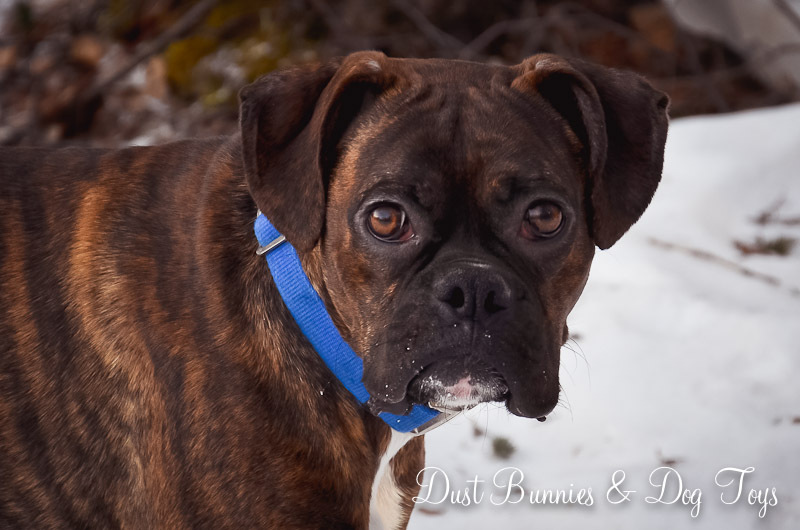 She will be ready to join our family in mid-April and we’re excited to see how everyone reacts to her. Baby momma’s owner says momma and the pups are all doing well and although little Bacardi is by far the smallest, she’s a fighter and does get some one-on-one time with mom. Sounds like she will fit right in around here. Apparently that mystery wasn’t interesting enough to keep me up, because I started nodding off again. Until… “BEEEP! Low battery!” I’m pretty sure that’s when I buried my head in the pillows. A few minutes later the shower stopped and I mumbled at the hubs that the smoke detector was beeping. He went to investigate, but it didn’t make a single noise for him. Typical, dysfunctional mechanical things always know when the man is listening for them to resonate their problem and therefore don’t! I went back to sleep and the invisible lady in the detector kept quiet until after the hubs left for work and I had gotten up to get ready. Just as I’m crawling out of bed, she returned. “BEEEP! Low battery!” I’m pretty sure I flinched at the sound as I headed into the bathroom and turned on the shower to drown her out. Once out of the shower, there was a solitary “BEEEP” every minute. Apparently, there was some sort of cycle the warning ran on. How wonderfully annoying. Tequila was so upset that she came into the bathroom and hid in the water closet a “please make it stop” look. A bit later Stoli joined her, looking confused every time it beeped. Even the cat came in to complain at one point. Like any good mommy would, I talked them through it, telling them it was ok, but that I wasn’t about to climb a ladder at 6 am to fiddle with the darn thing. Finally, it stopped and we all continued our morning routine in wonderful silence. Then just as I was picking out shoes to go with my outfit…. “BEEEP! Low battery!” Jimminey Crickets! I texted the hubs to tell him about the situation and he promised to check it when he got home tonight. Luckily, it didn’t go off again before I left, although I probably rushed a bit at that point, so I was able to get all the kiddos out of the bedroom and close necessary doors before they had a chance to hide from the noise again. Now don’t get me wrong, I know full well the importance of these devices, but how do they always seem to need batteries in the middle of the night? I’m positive the batteries don’t go in at that time, so maybe the manufacturers need to add another 8 hours to the battery life so it warns us in the afternoon! And perhaps our builder should have warned us that our smoke detector talks, but then again, perhaps he didn’t know there was a tiny little woman with a voice 100times her imaginary size in the detector when it was installed. And at that rate, why is the battery dying just shy of us being in the house for three months? That must have been some clearance rate refurbished battery! 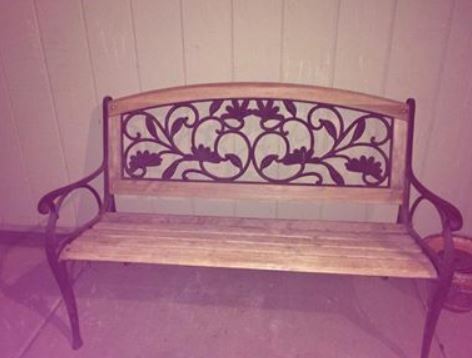 I haven’t been having much luck on the local buy/sell pages or Craigslist so I was stunned when I happened upon a post for a wooden bench for $40 and NO ONE had claimed it yet. I immediately commented that I’d come get it that evening or could send the hubs that afternoon. 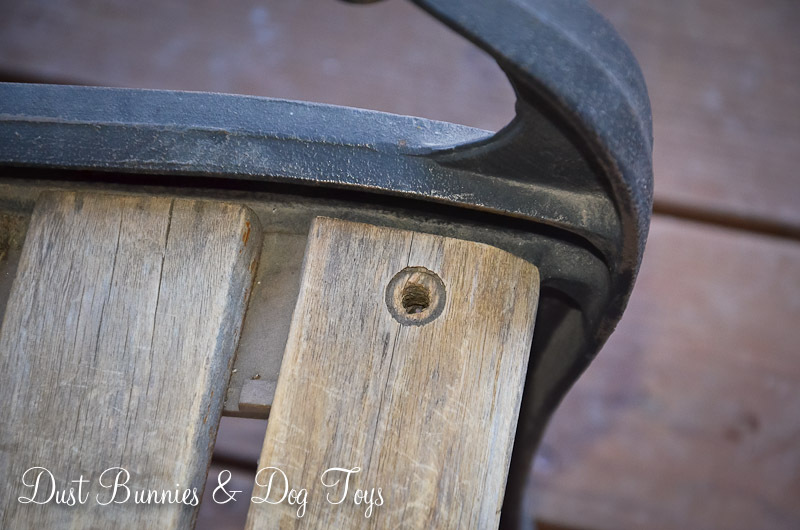 Once I commented that gal messaged me and said she had just realized there was a bolt missing on one side so she would reduce the price to $25. Um, no I don’t have a problem with that! I texted the hubs the info and let her know that he’d be by soon. It turns out the missing bolt isn’t too big of a deal. It is kind of important to make it more stable, but thanks to the return of the snow, we don’t spend a whole lot of time sitting outside. It’s also makes the perfect perch for Luna now that she’s started going outside on her harness when we take the dogs out to play. She’s not very fond of the cold and wants absolutely noting to do with snow, so she investigates the corners for the porch and then resumes her lofty viewpoint to watch her siblings bound around like crazies in the frozen wilderness. 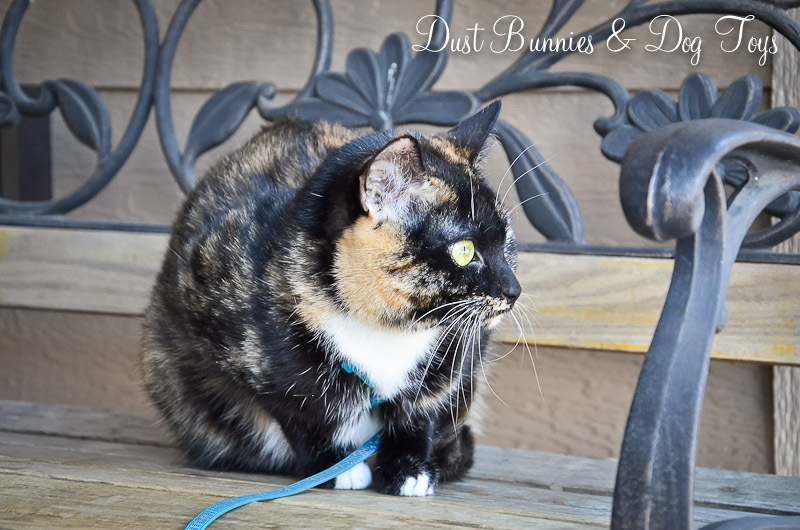 She’s used to being on her harness outside at her previous home, so we’ve continued that policy here for now. 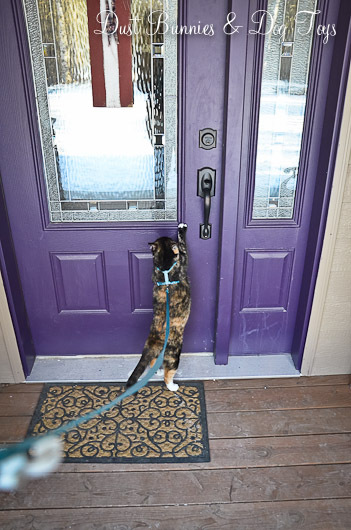 Hopefully, she’ll eventually get to a point where she goes out without it, although then she’ll have to have a collar with a bell so she doesn’t get too close to the birdies I plan to entice to our yard this summer! 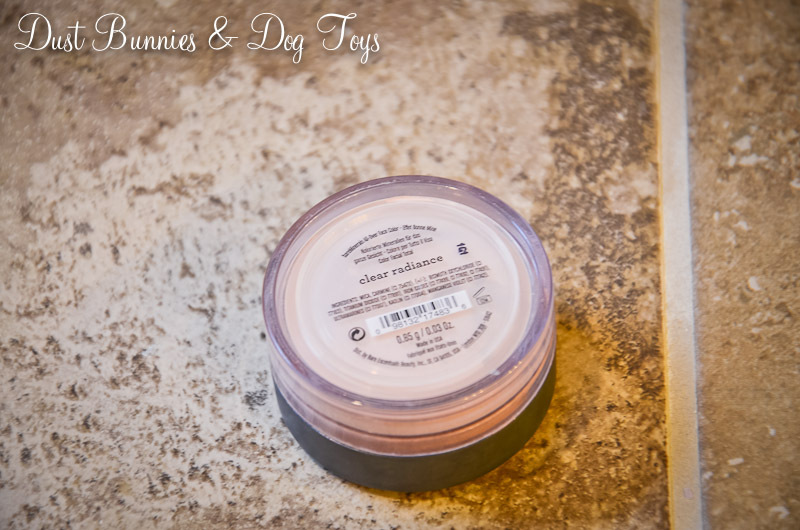 I thought I’d write a post about the beauty products I use since I was just showing off my organization of them. If I had to forsake all beauty products but one, I’d keep my chapstick. 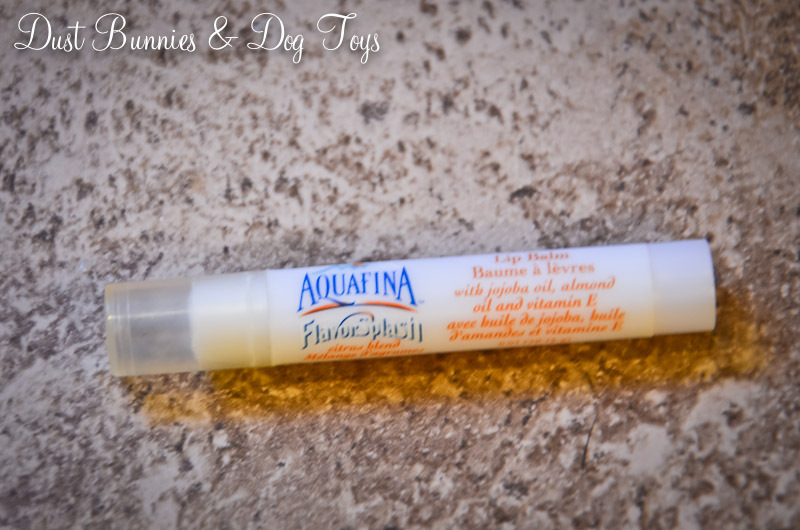 I’m typically extremely loyal to Softlips, but the hubs found a multi-pack of these flavored Aquafina lip balms on sale, so that’s what I’ve been using recently. 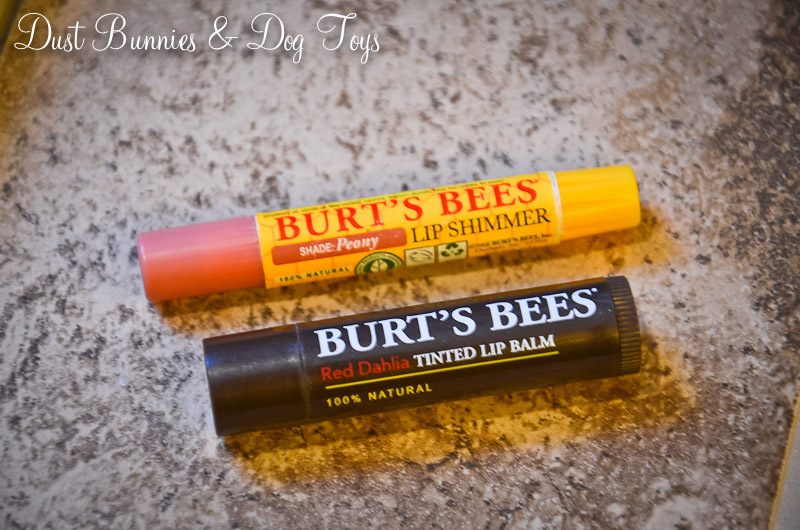 I’m not much of a lipstick gal, but I do like a little color, so I also use Burts Bees tinted lip balms. My favorite and most used is Red Dahlia, but I also like the Peony, which I found in a “lip shimmer” that is a little fanicer. Another essential item in my repertoire is my deodorant. I’m a sweater. I sweat. Even when cold. I can’t explain it. 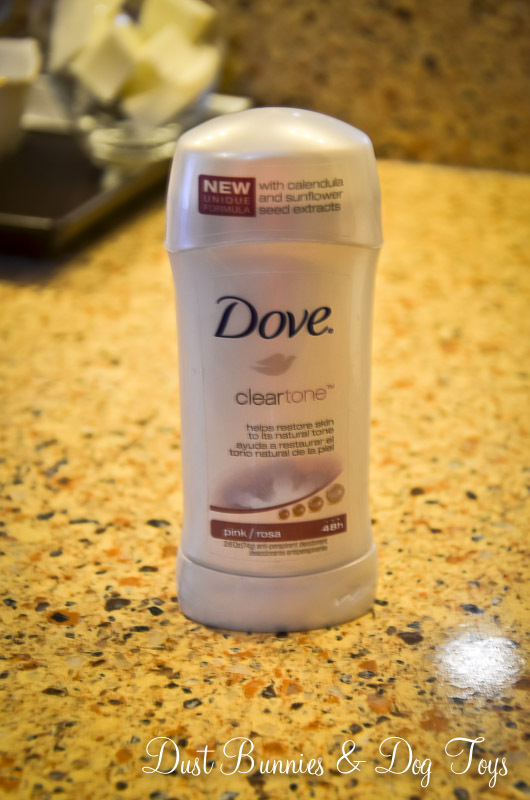 After trying many other varieties and brands I finally found Dove Cleartone, which keeps my underarms dry and irritation free. Hopefully they don’t have plans to change or pull this line anytime soon because if they did I’d be extremely upset. I long ago gave up foundation in lieu of a tinted moisturizer. Living in Alaska you take all the moisturizing you can get! 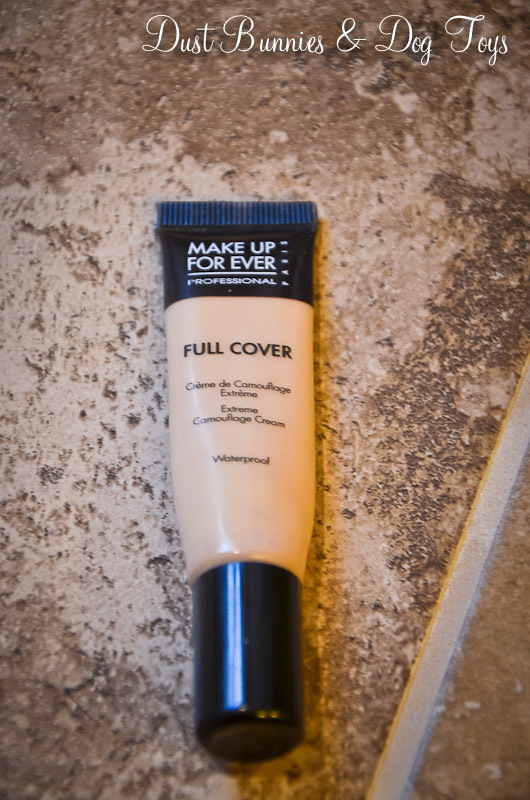 I like that it doesn’t feel as heavy as foundation but still provides adequate coverage. I’ve also found that my skin feels and looks healthier using a tinted moisturizer rather than foundation. 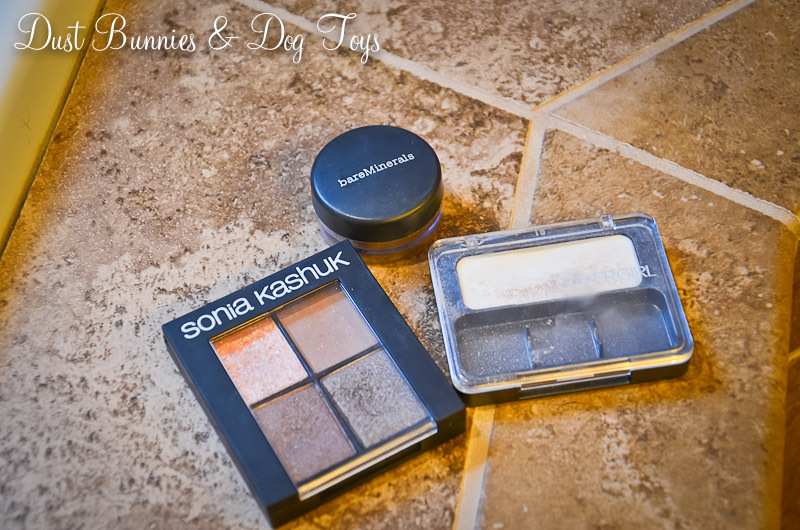 I really like Sonia Kashuk’s brand, especially because I can get it at Target with a coupon! Unfortunately she doesn’t offer a color that fits me perfectly, so I mix these two. 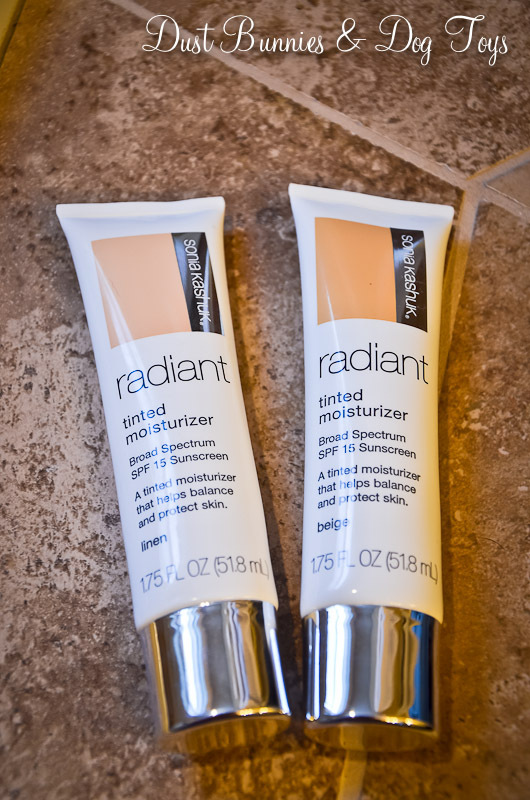 Works well when the seasons change and I do get a bit of color back in my complexion, I just adjust the mixture to match. My long nights and early mornings require a concealer. I discovered Make Up Forever’s Full Cover after my favorite blogger did a review on it. I still apply this with a sponge, but wet the sponge before hand and mix the concealer with some tinted moisturizer on my hand rather than go directly from sponge to face. My make-up instructor would be proud! This is my one splurge item, as it comes from that beauty wonderland known as Sephora. I’m running low these days and have been avoiding a trip to replace it because I know I want to check out an eyeshadow pencil reviewed by the same blogger….I’m sensing a pattern here. I tend to stick with neutral eye shadows in browns or grey. I picked up this Sonia Kashuk palette at the drugstore for the the gold color (which I thought might be similar to that eyeshadow pencil), but found that it’s ALL glitter and no color, so I ended up using the other three palettes. I also subscribe to the white in the corner of the eye to make you look more awake. I’m not sure if that’s exactly what it does, but it does help detract from the dark circles I usually have, even after concealer. I have a few Bare Minerals eye shadows I play with from time to time, but I always return to this grey color called celestine because it has just the right amount of sparkle. My eye shadow brush inventory expanded from one to three after my make up session. 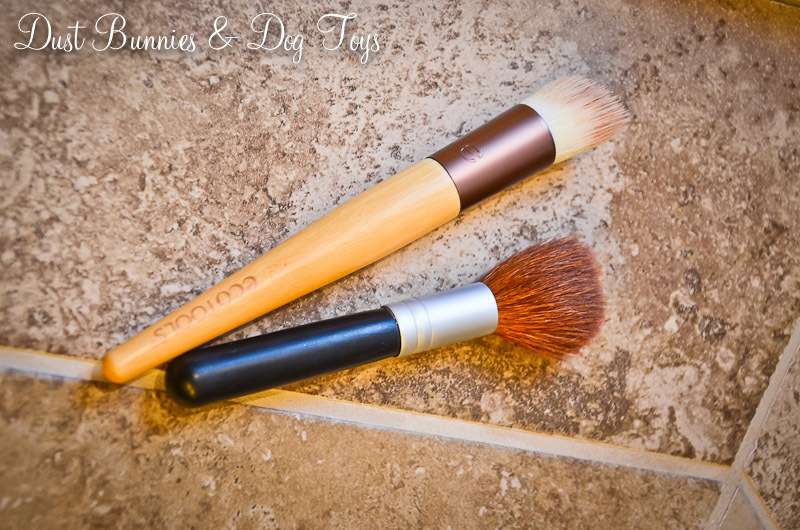 I use the white flat brush, which came as a set with my stippling brush, for the white shadow and the other flat brush to create an eyeliner effect with the darkest shadow. 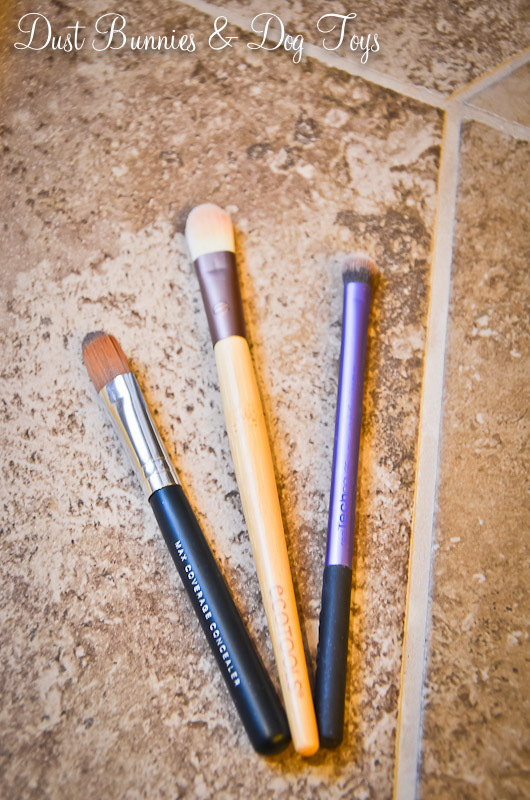 The rest are applied with the regular eyeshadow brush. Another result of having non-girly women in my family means I don’t have a lot of knowledge when it comes to hair styling. My mom and sister have beautiful naturally curly hair and I somehow got stick straight baby fine hair. You could always tell which of them did my hair for photos. Mom would create Farah Faucette ‘wings’, while my sister would leave everything straight and top my forehead with a 4″ high teased bang. Luckily, we’ve all matured a bit since then but it’s still an education in progress. I’ve discovered dry shampoo is my secret weapon because it gives my fine hair a little hold and texture so I can actually do things with it besides leave it down. 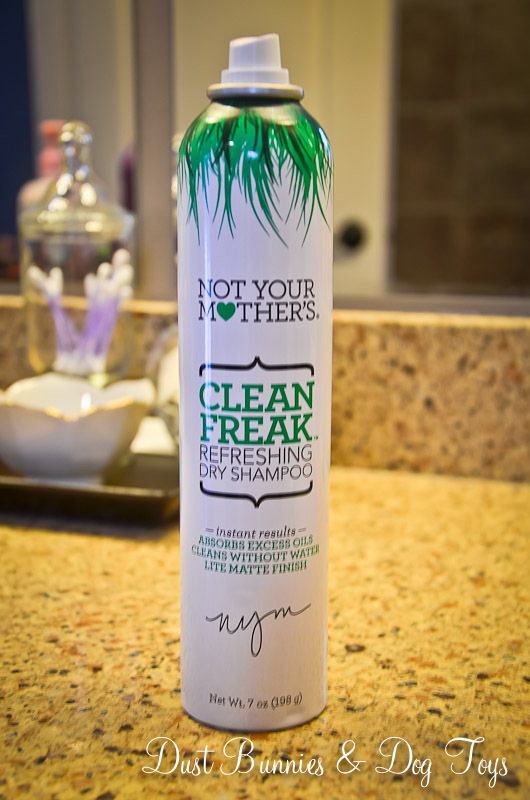 I tried a couple different ones and found Not Your Mother’s Clean Freak to work best for me. It’s not overly sticky and it sprays in a nice even amount, rather than the high pressure burst some dispensers give. And the fact that I can get it at Target for around $5 is the cherry on top! Along with dry shampoo, I use a fine mist, volumizing hair spray. I’m a fan of Vavoom and used it for a long time, but it’s not easy to find up here unless I hit the high end salons in the mall, which I tend to avoid. 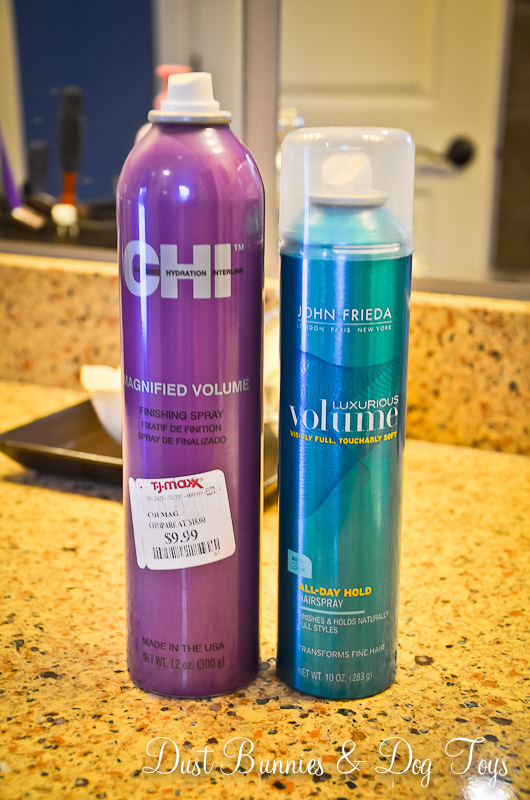 I picked up this CHI hairspray at TJMaxx during a trip to Portland last year and like it (likely more so because of the purple packaging!). Unfortunately, I’m running low so I picked up this John Freida voluminous hair spray at the drug store. I’ve only used it once so far, but it seems ok. Not quite as great as the Vavoom or CHI, but not bad for a drugstore option. 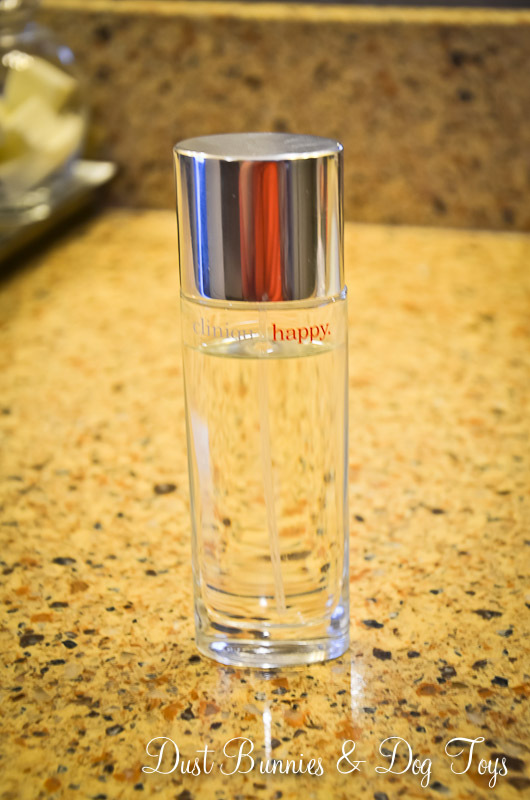 I’m not a big perfume buff, so I tend to stick with a single simple, clean scent. I like Clinique Happy because it’s light and fresh, but still a little sweet. This is my every day scent. I also have a bottle of Miss Cherie Dior, which I love and break out for special occasions or when I want something a little more intense, although I find it a bit much for my daily office gig. And lastly I need something to take it all off every night, which is why I use make-up wipes. 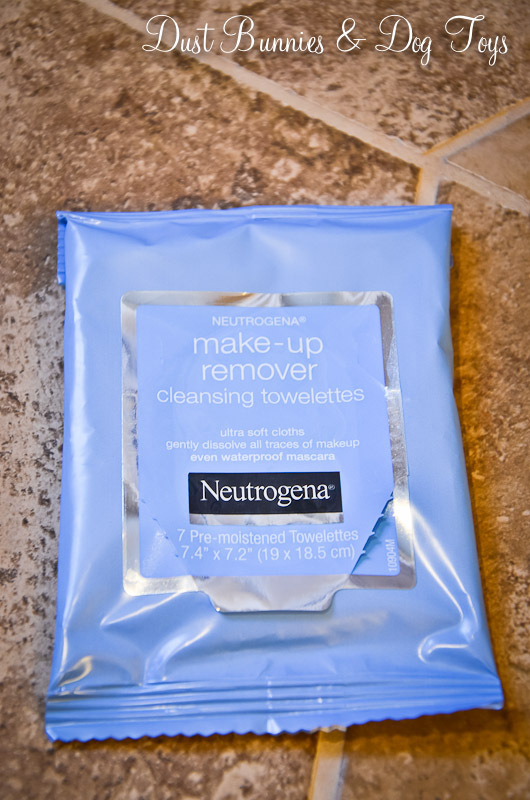 I usually buy the generic, exfoliating ones at Walmart because I find they work just as well as the other brands, but the hubs found a bulk pack of these Neutrogena wipes at CostCo, so that’s what I’m using right now. So that’s my beauty line-up. Fairly simple, although it’s gotten a bit more complex over the past few years as I learn new tips and tricks. And it’s all pretty frugal since everything is available at a drug store with the exception of my concealer. And let’s face it, if you’re gonna spend big bucks on a makeup product that’s the one to splurge on! Now I want to hear from you. What beauty product could you not live without? 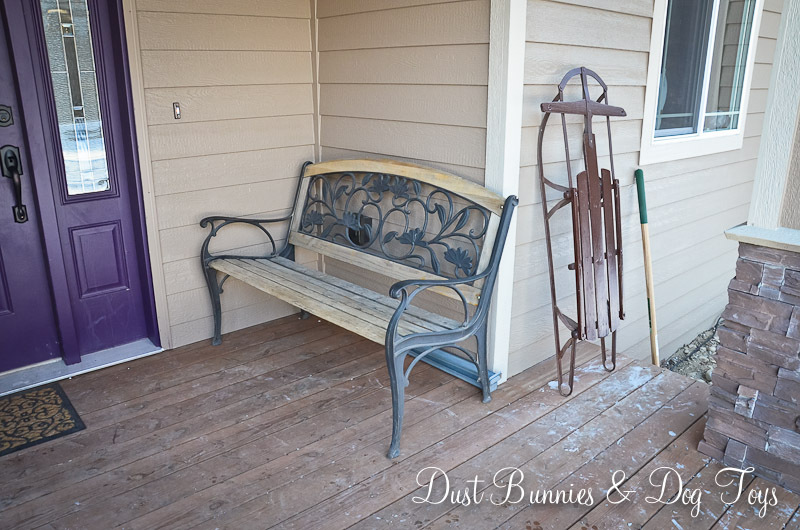 If you’ve read this blog at all you know I crave organization. Maybe I’m OCD, maybe I’m just weird, but whatever the reason, I need a routine and having a ‘home’ for everything. It makes life less stressful when I know where things are and can find them right away. That’s exactly why my morning routine needed some organizing. 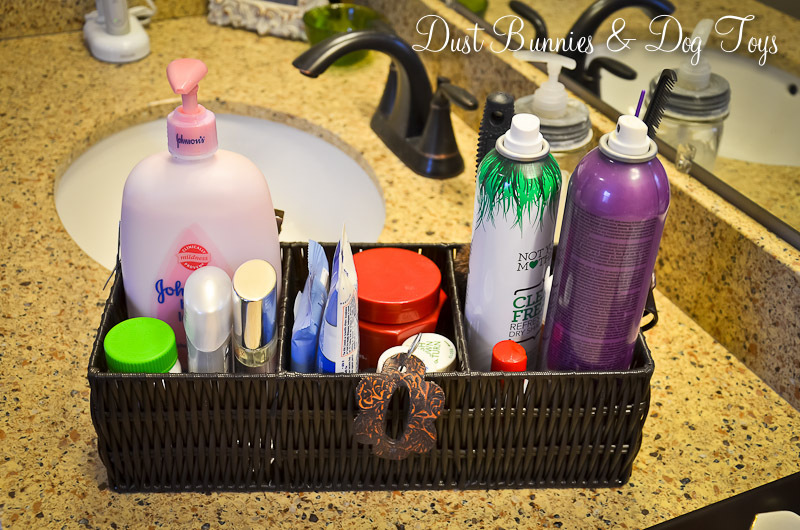 I had all the items I use on a daily basis in the bathroom, but most of them lived under the counter and had to be pulled out one-by-one as needed. Then I saw this post on one of my favorite blogs and had an epiphany. I could put all of those items in one container and pull it out each morning! When I’m done, I just put it back under the counter, out of sight. It took a few shopping trips to various retailers, but I eventually found a three compartment basket made of vinyl. Not only is it pretty, it’s durable and waterproof. Perfect for daily use in a bathroom! I organized everything into groups of how I use each. 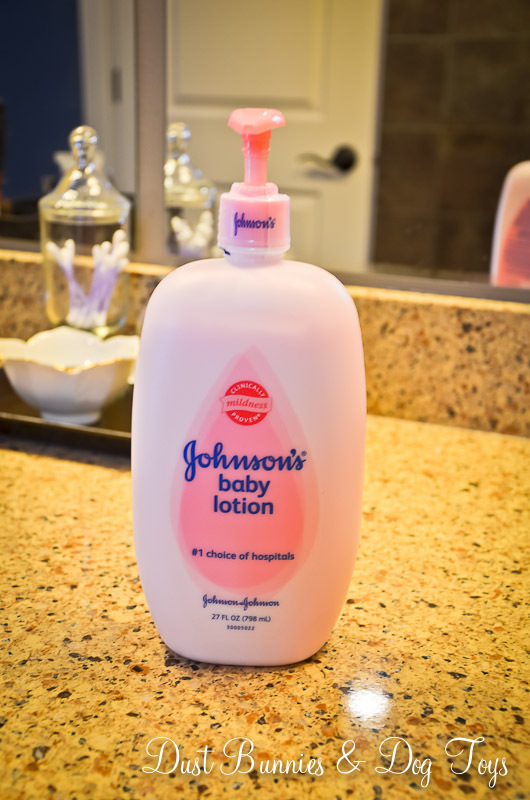 First are the things I apply after getting out of the shower – lotion, deodorant, perfume. All of my hair brushes and products are in the back compartment because they are usually taller. The center compartment holds my toothpaste, jewelry cleaner and other items that don’t fit into either of the other compartments. 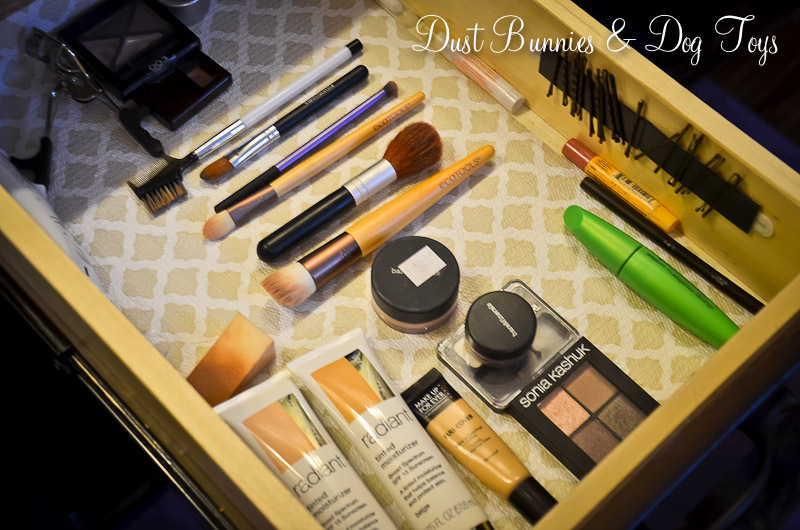 I also brought some organizing to my make-up drawer, by lining all my items up in the order I tend to use them. Luckily, I keep it pretty minimal when it comes to make-up so I was able to keep it pretty simple. I have a few items that I only use occasionally, so I keep them in the back of the drawer. This is the same drawer I described in my last post, where I used magnets to hold my bobby pins. Have you organized your morning routine? Do you have tips on what worked or advice on what not to do? Share them below! Three-day weekend are always a treat. 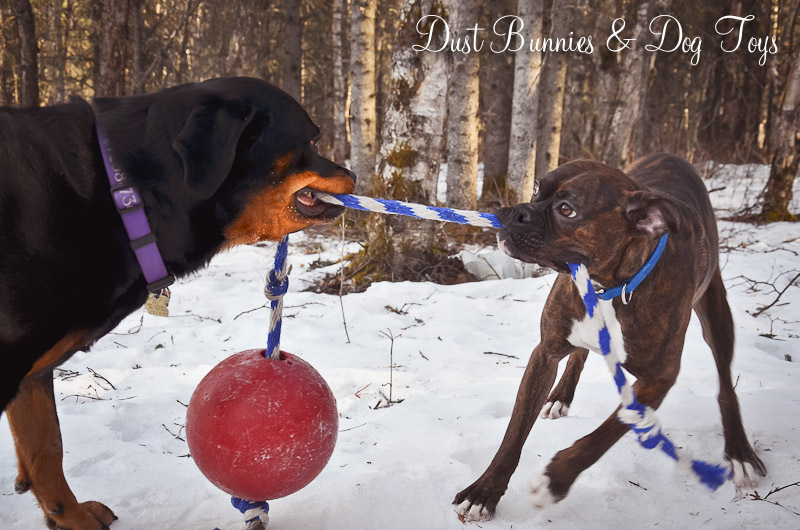 I didn’t get quite as much done as I’d hoped, but I did make time to have some outdoor fun with our doggies. 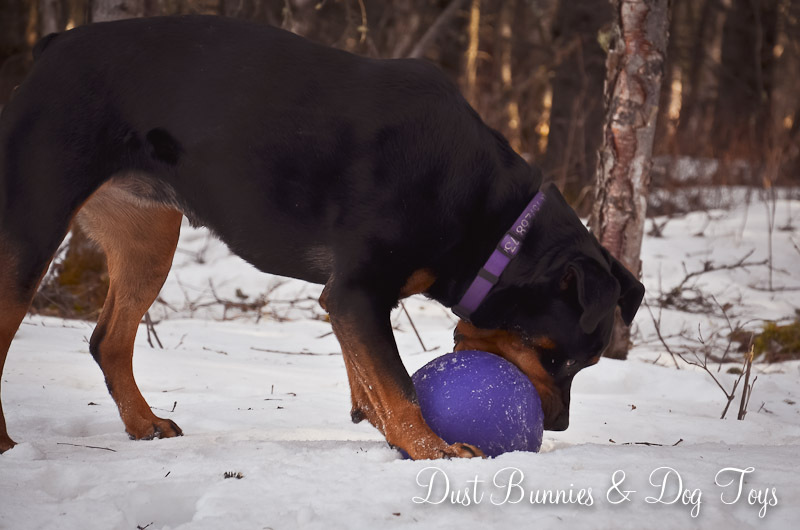 Although it’s still pretty chilly, the sun was out for most of the weekend and we sure took advantage of it with a little round of ‘ball’ in the backyard. 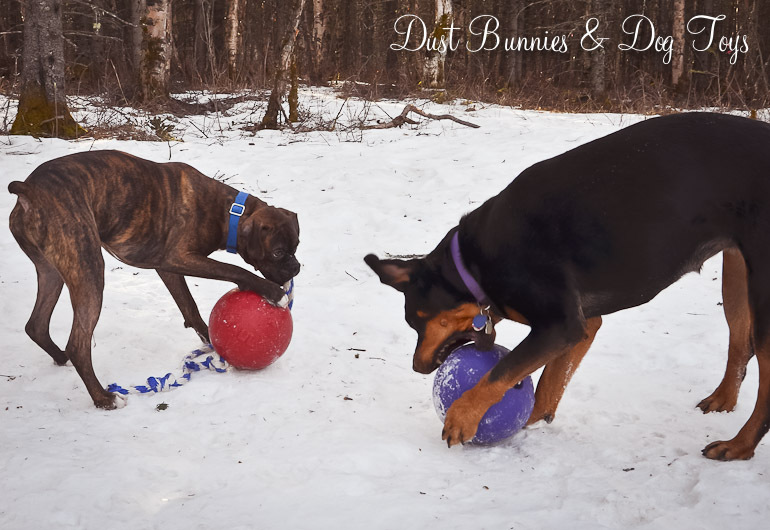 These giant balls were a gift from their Auntie Mere & Uncle Mark almost three years ago and they are still going strong, albeit with new rope. Once the ground thaws and we landscape the yard I plan to put posts in and tie these up so they can play tether ball. 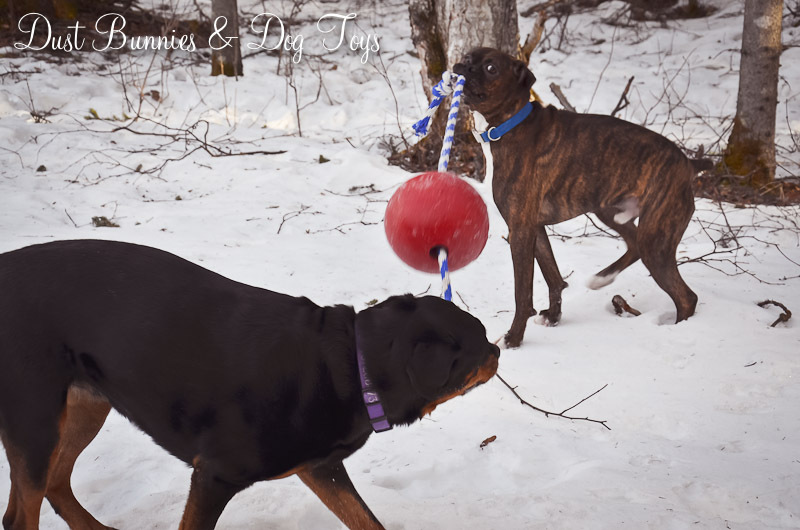 We had tied it to a tree branch but Tequila kept playing so hard she’d break the branch! 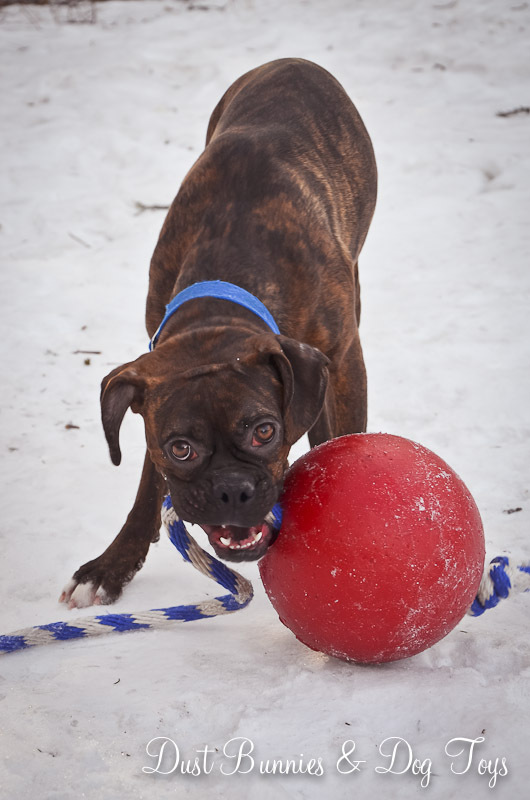 So for now, it’s perfect for tug o’ war. But in the end Tequila just had more muscle than him. 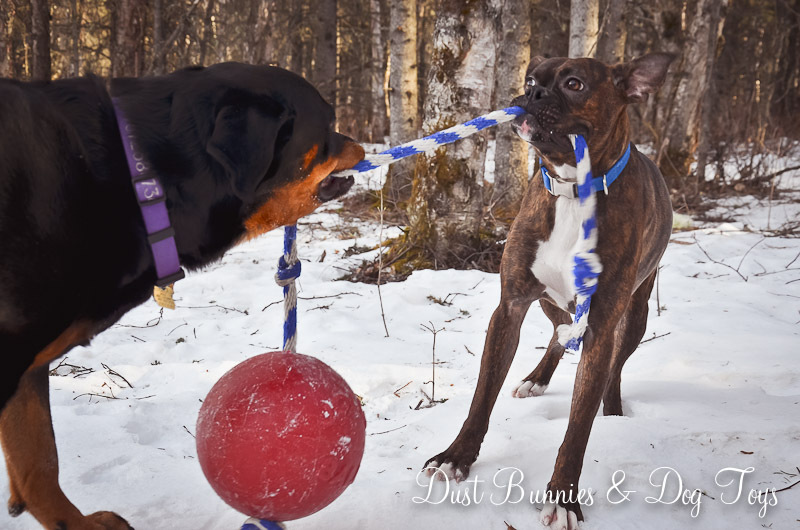 And when she trotted off with the ball after he gave up, this was the pouting face I saw. I often need bobby pins to keep my baby fine hair in place when styled up. 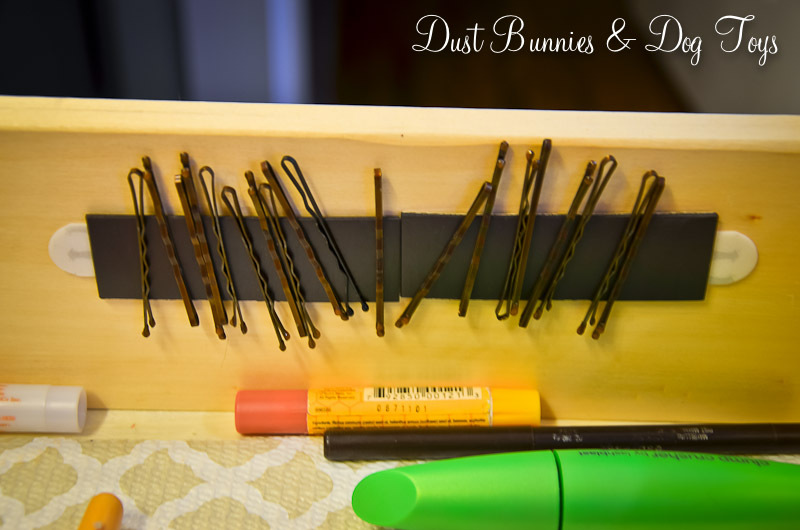 But I didn’t want to have bobby pins covering my vanity, so I started keeping them in a little bowl near the sink. But even that seemed a bit messy to me. So took to Pinterest to find a solution. Within minutes I had one. A magnet strip along the inside of a cabinet door. I adapted the idea, putting my magnet strip inside the drawer where I keep my makeup, which is usually open and in easy reach while I’m getting ready each morning. All it took was a couple of 3M adhesive strips on either side, that way I can move it if I decide I want them somewhere different in the future. I think it took all of a minute to gather my supplies and install them. Best of all it’s been working like a dream. Quick, easy, and functional. It just doesn’t get any better than that!